ABBA - Forever, presented by Sweeney Entertainments, is one of the UK's leading International tribute shows. 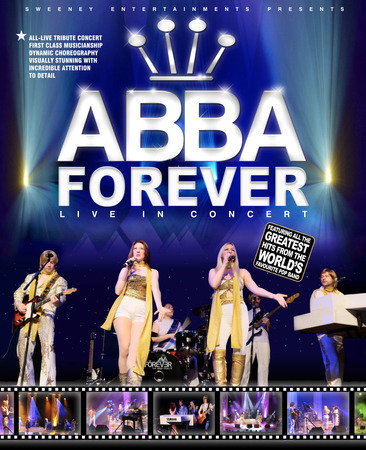 ABBA - Forever, presented by Sweeney Entertainments, is one of the UK's leading International tribute shows and theatre audiences from across Great Britain and Sweden have long enjoyed this superb recreation of possibly the world's greatest pop band. The unique Abba sound is replicated with an incredible attention to detail, using a six-piece band featuring electric and acoustic guitars, keyboards and piano, drums and bass guitar. Two outstanding Abba girls complete the line-up, adding the essential glitz and glamour to a well-polished and gently humorous show. The superb lyrics penned by Benny and Bjorn are sung in wonderful harmony by all six performers on stage. Dynamic non-stop choreography, stunning visuals, top-class musicianship and an ALL LIVE performance ensures that the ABBA Forever show captivates audiences from the opening refrain to the final sing-along chorus of this two-hour spectacular. Sweeney Entertainments, co-founded by Julie and Peter Sweeney, has been providing a wide repertoire of top quality touring shows for theatre and corporate events for over fifteen years both in the UK and internationally. 2017 was the company's strongest year to date with more shows touring than ever before and 2018 brings even more new shows and UK tour dates. Julie Said "Abba Forever is a great concert experience for all ages, authentically reproducing some of the best pop hits of all time. " Jane Ellis, who performs as Agnetha in the show, said "I am very fortunate to have the opportunity to perform some of the best songs of all time and tour some of the UK's most prestigious venues and beautiful theatres. We play all the big Abba hits and more, even putting some surprise album tracks in there for the most ardent Abba fan. " Packed full of excitement and exuberance, Abba Forever will take you on a journey back to the 70's guaranteed to get you up and dancing in the aisles.